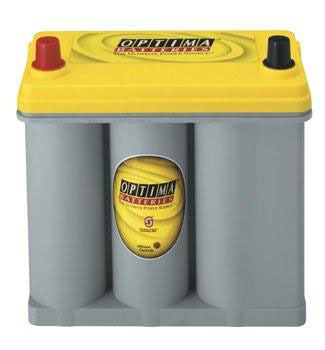 Have you always been a fan of the Optima battery line but bummed that you couldn’t get one to fit your Honda or Nissan 240 SX. Well those days are over. 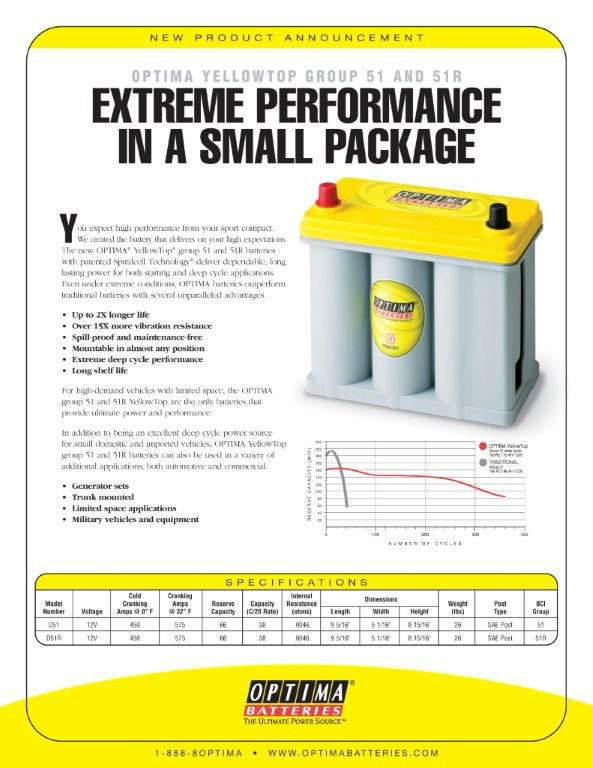 Optima now offers a smaller battery to fit smaller vehicles especially sport compact performance rides. 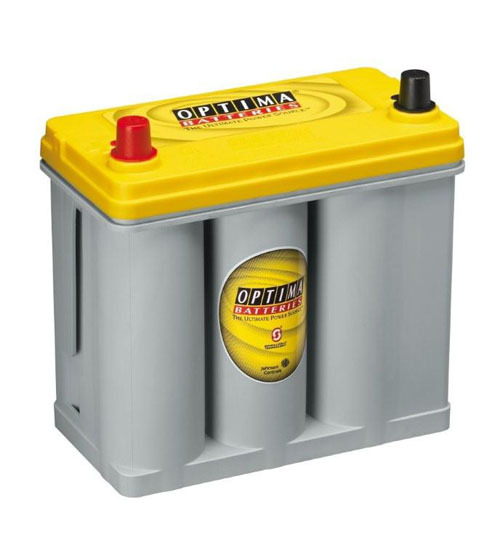 OPTIMA is like no other battery in the world. 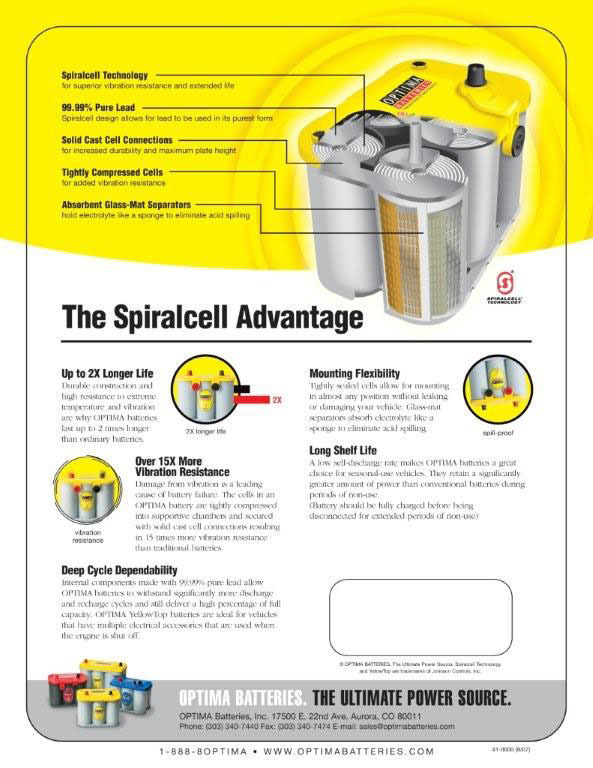 The unique SpiralCell design offers the most advanced technology and provides a strong and clean power source that far surpasses any of today’s filled lead-acid batteries. With OPTIMA under your hood, you can count on a longer lasting battery life under starting and deep-cycle applications. Since today’s power demand from cars, trucks, and SUVs are greater than ever, it’s even more important to install a power source you can count on. Over the course of history we have upgraded and customized our vehicles in such a way never imagined by early engineers. We continue to add more lights, LCD screens, gaming systems, stereos, laptops, cell phones and a bunch of other accessories into our vehicles. All of these electronics demand a better, more powerful battery. OPTIMA batteries even has safety in mind – with its completely sealed case it helps to ensure the safety of you, your family and the environment. The long list of benefits including 2x longer-life, leak-proof, vibration resistance, multi-position installation, longer shelf-life and higher reserve capacity make OPTIMA batteries the choice of millions. Find out more at Optima Batteries. ← Project Mu Calipers now come in different colors.